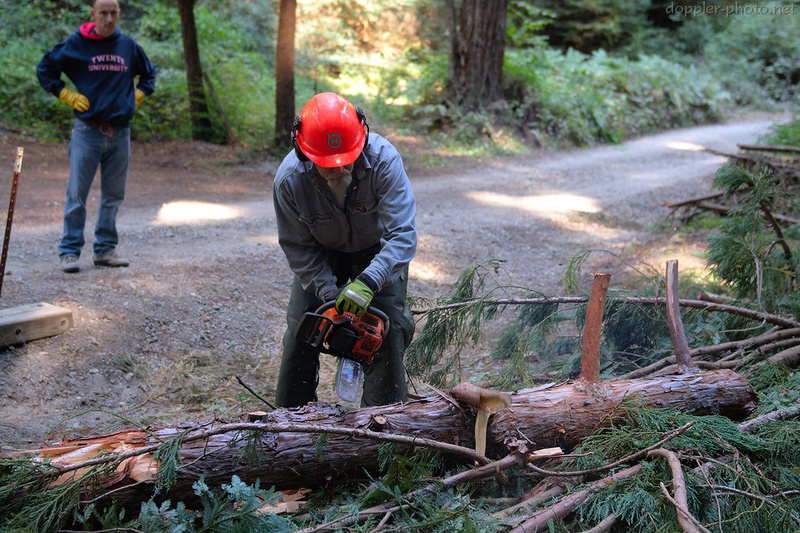 The history of the forestry industry spans ages, continents, and cultures. And for certain, these four chapters have been but a glimpse into one microcosm of that tradition. But even in that glimpse, I've learned so much about the process, and I hope you have as well. 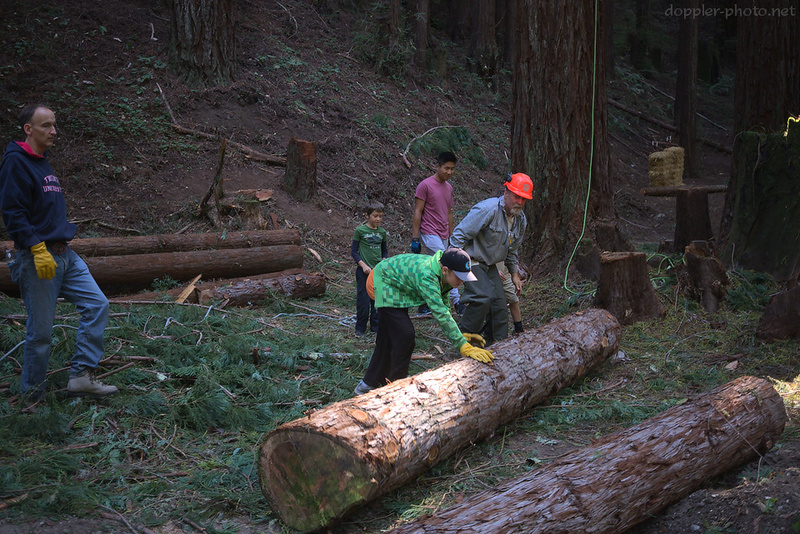 We started with a 200-foot-tall Redwood tree. 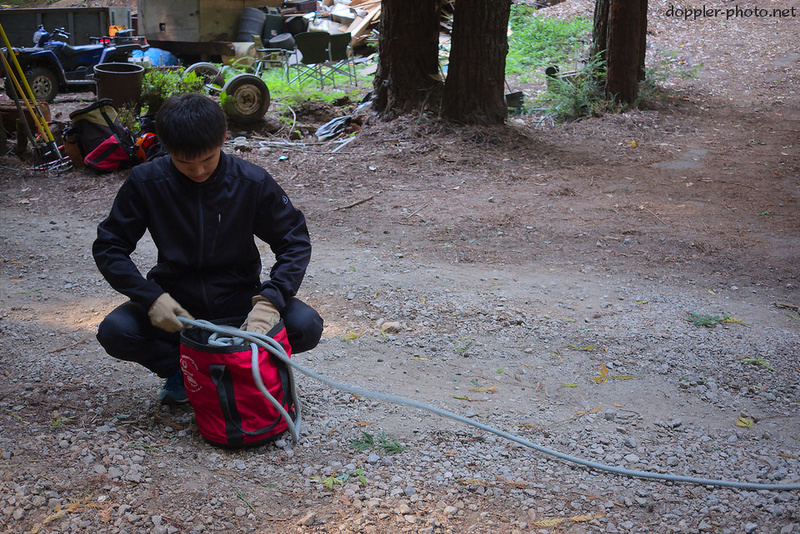 In part one, we saw how Matt, the arborist, erected infrastructure to move himself and his tools up and down the tree. In part two, he completed the "limbing" process, forming a bed of branches, and also removed the top of the tree (which was too narrow for him to safely climb). Part three took us through the hinge-cutting technique, which Matt demonstrated at ground level, and then put into practice 100+ feet in the air. Of course, the process doesn't end there. 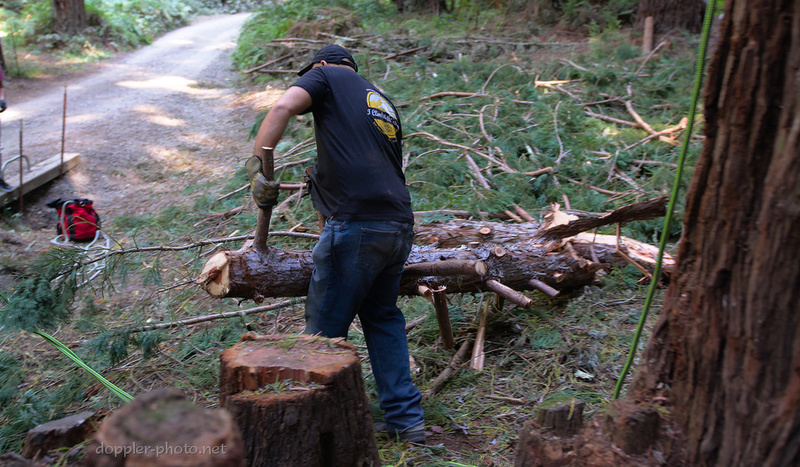 Once each log reaches the ground and Matt declares the all-clear, it's time to get back to work. The first trunk section broke in half when it hit the ground. The combination of its length and narrow diameter made that outcome more likely, and when the piece struck the ground at an angle, it pretty much sealed the deal. The break and the untrimmed stubs made the piece impossible to roll, so one of the volunteers wrangled it away from the drop zone. From there, Mark trimmed the stubs with his own saw to make the piece more manageable. Rolling is a lot easier than lifting, and the narrow piece was still just large enough to convince Mark to send it through the sawmill. Meanwhile, after each log fell, someone would untie the attached 300-foot rope, and coil the rope back into its bag, until it was time to pay it out again. Keeping the rope in the bag helped to avoid accelerated wear from the sharp stones in the area, and also kept it from tangling or picking up debris as we applied tension to the next segment. Once the coiling was done, Matt would drop a utility line, someone would tie the free end of the rope to the line, and the whole arrangement would reset. 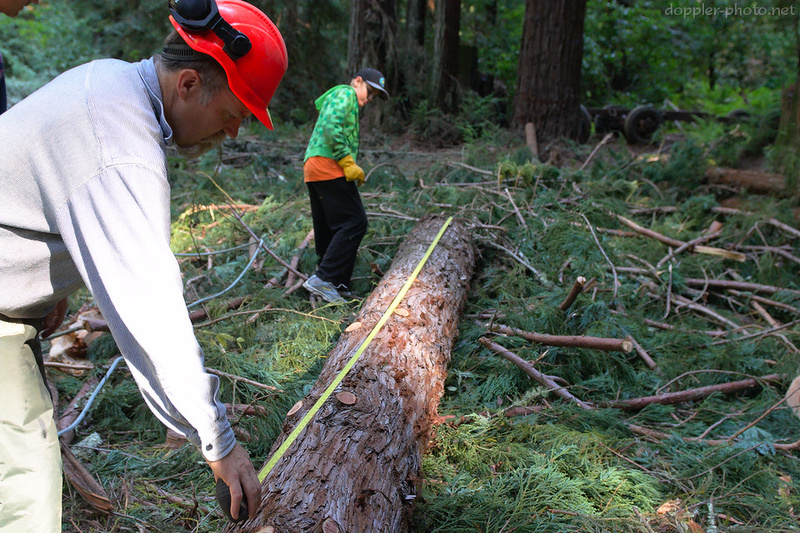 Every once in awhile, Mark would measure a log to give Matt a quantitative sense of what lengths he was cutting. 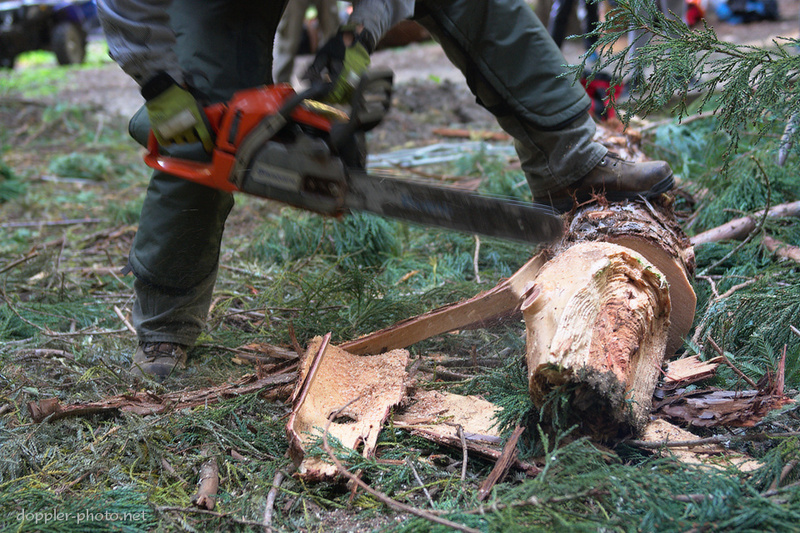 Overly-lengthy logs are more liable to break, but also, they're just heavier and more difficult to work with. Mark has a tractor to drag the logs up to his mill, but the tractor has a weight limit, and the mill has a size limit as well. And at last, we would roll the latest log off the bed and out of the way so that the next cut could commence. But with 100 feet on the ground and 100 feet yet to come down, we ran out of daylight and the work stopped. Time will tell if or when the next work day might happen, but with 100 feet to go, and with the felled logs still awaiting the milling process, I'm definitely looking forward to the next forestry adventure. How many times was Mark up and down the tree through all this?